Although it may not appear to be the case, I’m actually at the beginning of a series on the brewing (and enjoyment) of vintage beers. This series started nearly two months ago with a post on two well-aged beers I’ve brewed since starting this blog, and continues today with a review of one of the best beer books I bought this year – Vintage Beer – A Taster’s Guide to Brews That Improve over Time by Patrick Dawson. You’ll notice that I said “beer book” not “brewing book”, because nowhere in the pages of this book will you find brewing tips or recipes, nor any discussions of bringing commercial-scale processes into the home brewery, nor any discussion relating to home brewing ingredients, scales or methods. Despite this, this is one of the most important home brewing books I’ve added to my book collection in many years. This book is a must have for any home brewer who brews – or is thinking of brewing – long-aging beers. I’m certain you’ve had the experience when, while reading a book, the jumbled ideas and experiences you’ve collected over years of brewing (or other hobbies/activities) become “crystallized” in your mind – the book brings organization and clarity to the various thoughts, ideas and experiences you’ve accumulated. For me, this is one such book. I’d been brewing strong beers for aging for over a decade, and in my mind I’d collected a series of rules and guidelines for making beers that aged well – “always use English hops” was one; another was “never use a bit of dark malt when a larger amount of a less-killed malt will do”. This book explained those ideas, put them into context, and added to and built them into a more concrete understanding of why I came up with those rules and why those rules worked. This is an important topic, which will be covered in a few upcoming blog posts. But back to the book. For the hopebrewer, the first 57 pages of the book are the most important. 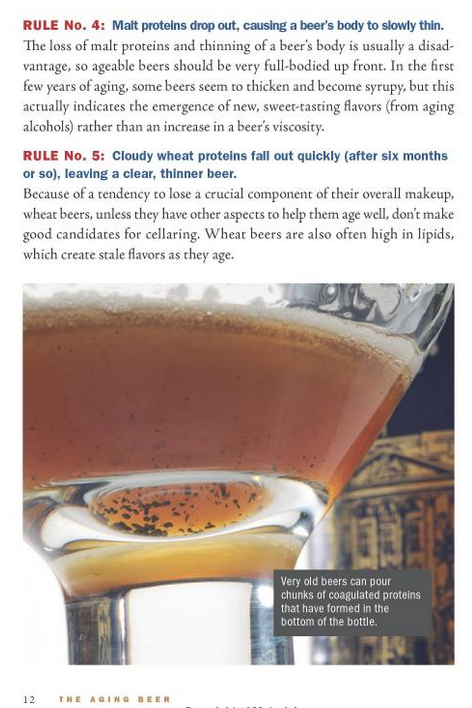 In these pages the author goes over a number of things to look for in beers to determine their aging potential – which, for the homebrewer, easily translates into recipe design guidelines. Which malts and hops work & why is explained; as is why residual sugars are key, and so forth. Moreover, work-around for common problems (e.g. using hard water to avoid autolysis in Imperial Stouts by limiting pH drops) can also be found in these pages; a close reading of this book will help set you up for success. Amoung those same pages are descriptions of how the flavours should change as the beer ages; again, giving the homebrewers insight into designing their beers to produce the desired flavours after a long aging. The later pages of the book are dedicated to the various styles the author has identified as being good for cellaring, some examples of how commercial examples age, and some hints and tricks for setting up your own cellar – including some discussion of the fractious debate over whether beer should be stored on its side or upright. All-in-all, this is a book that will provide the homebrewer with an abundant amount of information which they can use to both design/brew long-aging beers, as well as set them up for success in cellaring both their own, and commercial beers. If you’re interested in vintage beers, this book is a must-buy. There is one last aspect of this book worth mentioning – not only is it a fabulous source of information, but it is also gorgeously laid out and illustrated. Almost as much space is dedicated to photos as is to text. The photos are minimalist and beautiful – often spanning a whole page. This book is pocket-sized, but it should be in coffee-table format. Thanks! And enjoy the book – it is excellent.